As a new mom, it's often easy for me to wish for days to rush by. "Hurry along, time." I say to it as it hurries by, one step closer to bedtime. Even though there are lots of moments of joy and sweetness in my days, they are often slow and repetitive. One task over and over. At this age, Luke still needs a lot of attentiveness and one-on-one time, but he's also too little to do much. We do the same things again and again--jump, eat, change his diaper, watch the dog, practice sitting, do tummy time, eat again, read books, take a nap, etc. But, there are moments when I stop rushing time. I say to it, "No. Don't go by so fast. Wait." Those moments when Luke's cheeks are smushed up against mine--full of slobber and babyness. Or his baby giggles communicate pure delight. Or when he puckers his lips and goes, "chhhzzzz" and split flings everywhere. 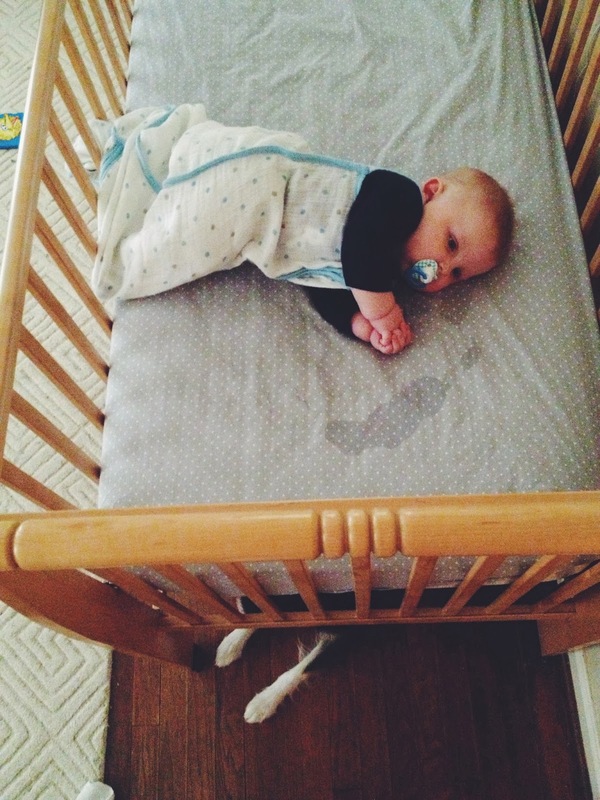 Or when I walk into the nursery as he's falling asleep and his chubby fingers are folded together and the puppy is peeking out from under his crib. These moments. I don't want to let them go. I want to grab hold of them as they rush by and tuck them away with me forever. Beautiful post, Nicole. I think you're doing a great job! Oof thank you for that sweet picture (and the words, of course). I'm pregnant with #3 and sometime I think about the future in terms of efficiency...we'll be able to go do this at this age and it'll be nice that the older two play together b/c I'll have to nurse, etc. But then sometimes I get these heart swells, where I'm just so overwhelmed that I get to slow down and do this newborn thing again. Your post gave me one of those beautiful moments!